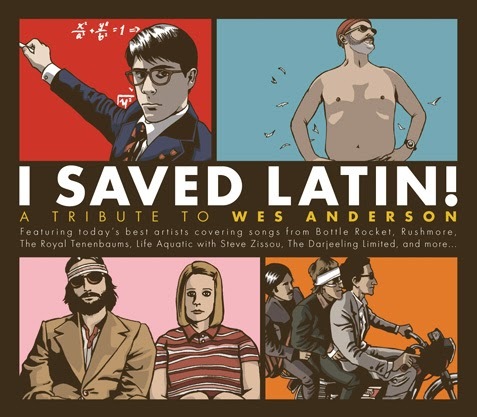 American Laundromat Records has released its latest compilation of indie music, all based on the soundtracks of Wes Anderson films. As a devoted fan of the director, I also appreciate the vital role of music in his artistic vision for each story line. Each song is carefully chosen and placed accordingly, so listening to this compilation had movie scenes flashing in my mind as well. It also had me yearning for a listen to those classical music moments inserted by Anderson, for example Claude Debussy's "Clair de Lune" in The Darjeeling Limited and Benjamin Britten's "The Young Person's Guide to the Orchestra" plus more in Moonrise Kingdom. Returning to this double CD selection of 23 tracks, I was reminded how the best covers succeed in keeping the essence of a song while providing another life for it at the same time. A good example is how the band in my last post, Dr. Dog, gave "Heart It Races" its signature, laid-back jam approach to this quirky, angular tune by Architecture In Helsinki. My favorite one here is "This Time Tomorrow," by Telekenisis. I heard it first on KEXP and rightly so, as the artist a.k.a. Michael Benjamin Lerner is from Seattle. But I wonder how much of the attraction is based on how much I have enjoyed the original by The Kinks, along with the new treatment here, yet also the use of this sweet tune in The Darjeeling Limited? There's also a hypnotic version of David Bowie's "Ziggy Stardust" by Margaret & the Nuclear So and Sos and The Ghost In You finds a mellow vibe for John Lennon's "Oh Yoko!" Check out the Telekinesis song below and much more on iTunes or Amazon -- better yet buy it directly from the American Laundromat Records website here and pick up some sweet merch, such as a Sam & Suzy Tee, Rushmore-inspired lapel pins or that ubiquitous red beanie from Team Zissou!